A novella written collectively by Nathan Cahill, Jack Cole, Padraig Cunningham, Dorothy Hunter, Valerie Joyce, Ronny Koren, Stephen Lau, Roisin McVeigh, Sara Muthi, Sadbh O’Brien, and Hannah Tiernan is now available for purchase at The Library Project, 4 Temple Bar, Dublin 2. I’m just a necro heading to a polis. 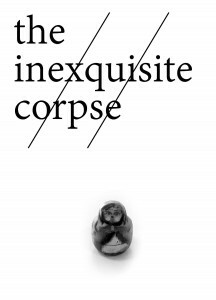 Unlike the methodology of “exquisite corpse” where each collaborator consecutively adds to a text in sequence, this novella has been continuously and collectively reworked and reedited by the authors. The Inexquisite Corpse is a gauchely assembled, rickety, interruptive, conflictual account, where no rule prevails and no voice dominates.